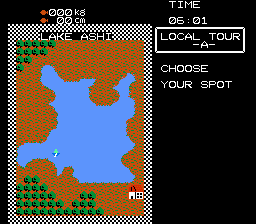 The Black Bass is a fishing game for the Nintendo Entertainment System. 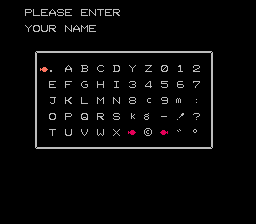 This is an English translation patch for The Black Bass, published for the Famicom in 1987 (as a port of an MSX version) by HOT-B. 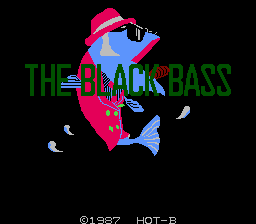 This should not be confused with the game of the same name that North America got (also known as The Black Bass USA), which was actually a localization of the sequel, The Black Bass II. 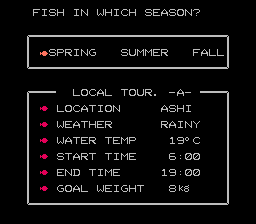 As you might expect, this is a fishing game where the object is to catch as many bass as possible within a day on each of the five maps which are based on real Japanese locations. There are other fish that can be caught as well, including a mermaid, though this only counts for bragging rights. 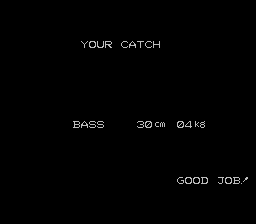 This first game is inferior to its sequel in most respects, but it is also quite a bit easier as you are only judged on total weight caught rather than the average weight, and big fish don’t seem much harder to catch than small fish. Despite the niche value of this game, its sequel was something of a cult classic in certain circles, so there might be some interest in this one out there.